Why I picked it up: This series is pretty popular and it came highly recommended by my librarian colleagues and my second cousins. 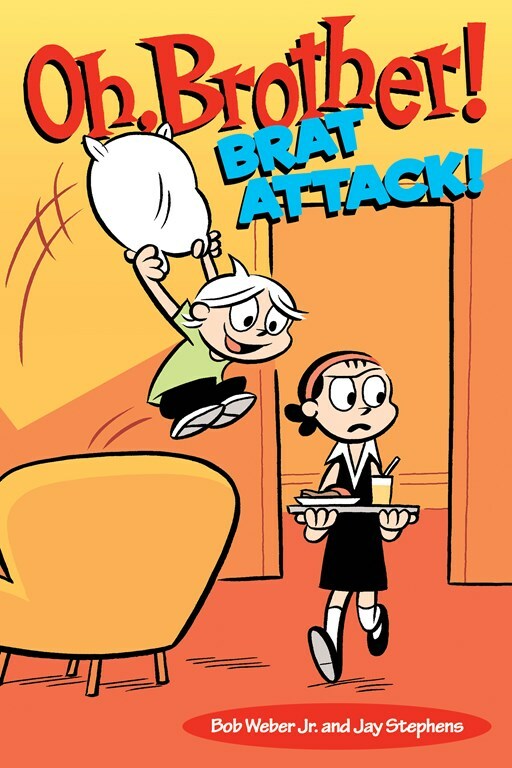 Why I finished it: This series is fun and funny, so I can totally understand the reader appeal. Yeah, I’m a little late to the game having only started reading the Holms’ work this last summer, but the sibling duo has definitely tapped into the mind of the reader and won their hearts. Christmas puns abound in this installment, beginning with a nod to ‘Twas the Night Before Christmas. Readers will laugh out loud at Babymouse’s somewhat over-the-top antics in pursuit of the perfect Christmas gift – to receive, not to give. I love the multi-cultural cast of characters made up of a host of different animals – plus, I found it appropriate that the mean girls are cats. Despite the cover, the book is quite pink, which contributes to Babymouse’s personality. The art is fun and whimsical, befitting our day-dreaming heroine and it’s simple. I write that, and it has a sort of negative connotation, but it would seem the Holm siblings are relying on the characters and the plot to fuel the story along. Rather than an intricate page with details galore, it’s easier to follow with minimalist backgrounds and the three color scheme – an important factor in encouraging reluctant readers. Babymouse is full of humor and wit that will appeal to readers of all ages and remind us that there is more to the holidays than just the presents. Why I picked it up: I have a soft spot for books about siblings. Why I finished it: For those of us that have been blessed with siblings – either older or younger – we know what’s going to happen with Lily and Bud before we even crack the spine. But even if the antics between the two siblings is somewhat predictable, the reader is instantly endeared to the characters because of their love for each other…even if it isn’t always obvious. Lily and Bud are involved in a constant battle of the wits, each intent upon showing up the other with their own brands of superiority. The quick, light-hearted humor keeps the reader engaged and captures the delicate love/hate relationship between brothers and sisters. It’s reminiscent of the relationships between Beezus and Ramona Quimby and Peter and Fudge Hatcher: we laugh with them, we get angry with them, we cry with them, we are happy with them. They are the sort of stories that not only carry a nostalgia factor, but make us smile and remind us of the fun and innocence of childhood. 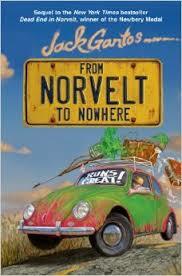 Cute, quirky, and funny, this book is sure to strike a chord with reader of all ages. Why I picked it up: I have friends with younger children that struggle with reading, and the Branches books are a great way to help with retention. Why I finished it: These books are not meant to be super deep by any means because it is designed to help grow readers, which means the author needs to get to the point a little bit quicker than some other beginning chapter books. 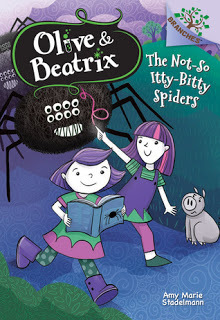 We are introduced to the twins: Beatrix is a witch because she was born at midnight on the night of the full moon; Olive was born two minutes later and even though she’s not a witch, she works her own magic with science. The sibling rivalry is something lots of readers with siblings can relate to, and it’s important to have stories that continue to relay the message that even if we don’t get along with our siblings, they will be there to back us up when we need it. I liked the sort of purplish motif with the art because I like purple and because it gives the story a sort of mysterious air that plays up Beatrix’s magic and Olive’s science. The chapters are pretty short (5-10 pages), so it is a pretty quick read that can be enjoyed alone or as a read-aloud. It’s not going to hit the mark with everyone, but I hope that these stories can reach out to struggling readers and help make reading fun. Farrar, Straus and Giroux, 2013. 978-0374379940. Synopsis: Just when Jack Gantos thought that his world had (mostly) righted itself, things start to get crazy again. In a series of events which includes an explosion that cancels school, a new old lady murder, and the death of Eleanor Roosevelt, Jack finds himself in the company of his neighbor Miss Volker. And this time, they’re going on a road trip to write an obit for their town’s founder and to catch the outlaw responsible for making her the last original Norvelter. Why I picked it up: I really enjoyed Dead End in Norvelt and I was eager to read more about Jack’s strange adventures with Miss Volker. Why I finished it: As a generalization, the stakes in sequels tend to be higher than their predecessors and in many cases, there is a heightened anticipation for the characters and the plot to be taken to the next level. Gantos certainly steps up the excitement and the sense of adventure, and has also found a way to deepen the relationships between the characters. The friendship that we saw developing between Jack and Miss Volker was definitely something special for both of them, though I doubt that either of them would outright acknowledge it. Generational gap aside, Jack and Miss Volker have a sort of symbiotic teacher/pupil relationship that allows for Jack to be pushed further toward his potential and Miss Volker to stay young. He’s much more than the companion he thinks he is, something he comes to realize as they journey further and further on their road trip together. And while neither finds what they are expecting at the close of the book, it’s evident that they have grown in more positive ways and become different people from when they set out from Norvelt. Gantos’s ability to write about people and how they connect is what draws the reader into his stories. Sure, they are funny, crazy, and even somewhat out-of-control at times, but in truth, it’s not much different from our own lives. It’s a feel good story that takes us on a wild ride in search of answers for which we may or may not already have the question. Viking Books for Young Readers, 2005. 9780670060078. 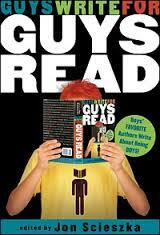 Synopsis: There’s something for everyone in this collection of stories about men and boys being, well, men and boys. Chosen by readers of the Guys Read website, the writers retell stories about their childhoods, how they got into reading, and how they discovered their passions and themselves. Why I picked it up: My reasoning was twofold: firstly, I love the Guys Read movement and its approach to encouraging literacy; secondly, I wanted to add some more guy-friendly books to my repertoire. Why I finished it: While this collection is aimed at readers of the male persuasion, as a female reader I was still thoroughly engrossed in the stories and drawings of the contributors. I feel as though the adventures and misadventures recounted are relatable to both genders. True, most of the girls I know never tried to climb up a fire escape with an extension cord, pee on an electric fence (not that we could if we wanted to), or shoot themselves across the neighborhood on a homemade slingshot. But I am willing to bet there were a number of us that bulked ourselves up to get noticed (like David Yoo), crawled over fences we weren’t supposed to, read the sports section of the newspaper, or got their start drawing doodles in the margins of their homework assignments. But I digress: this collection is boys and men doing what they do, and by all accounts, doing it well and having a good time doing it. For older readers, it makes us remember our younger days when we were much more fearless and the consequences seemed less severe. For younger readers, it gives them inspiration to find their passions…and even perhaps in new avenues of mischief. It’s a fun, funny, laugh-out-loud book that has an appeal for guys of all ages that reminds us we are never too old to be young. Synopsis: Gru is a changed man. He’s traded his evil plans for jam and jelly recipes and focused on being the best dad to his three girls, Margot, Agnes, and Edith. But even though Gru’s no longer scheming and plotting, other villains are, and the Anti-Villain League wants to recruit Gru to aid them in helping save the world. With the help of Agent Lucy Wilde, Gru agrees to the mission, but can he manage to maintain his cover and avert suspicions while still keeping an eye on his girls? Sequels can go either way, but very few manage to improve on the original. 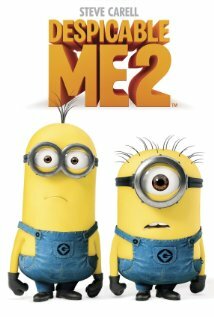 I wouldn’t go so far as to say that Despicable Me 2 isn’t a good movie – because it is a delightful movie – but I still like the first one better. The film starts up where the first left off, with Gru taking care of his adoring daughters after having decided to focus on being a dad rather than an evil mastermind. I appreciated that the original voices came back for this installment, and the actors have brought the same charm and wit to the characters that made us fall in love with them. The new characters are equally likable: Lucy Wilde, an over-zealous Gru fan who has been tasked with being his partner; Eduardo, a gregarious restaurateur who appears to be hiding more than just a top secret salsa recipe; Floyd, a hairpiece enthusiast who has taken a keen interest in Gru’s bald head. The animation style is also consistent with its predecessor: bright, fun colors that help to fuel the energy of the film, even when things get a little less than sunny. The humor tries to appeal to its target audience, but, let’s face it, there’s a lot of jokes that will go straight over kid’s heads but earn a chuckle from the parents. It’s a fun family film that explores the challenges of being a single parent and the strangeness of falling in love that will put a smile on your face and make you want to get up and dance. Synopsis: When the Monroe family decides to go on vacation without their beloved pets, Chester and Harold are booked ‘bungalows’ at the Chateau Bow-Wow. But their first night there, a horrible howling noise makes Chester dub their hotel the Howliday Inn. And that’s only the start: when some of the other guests start to disappear, Chester suspects murder and he enlists Harold’s help in solving the mystery. 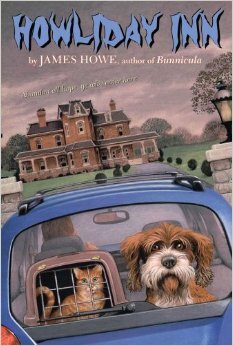 Why I picked it up: I loved Bunnicula and I wanted to read the other books in the series. Why I finished it: Harold is a delightful narrator that helps to keep up the suspense and mystery as the reader works to put together the pieces to solve the puzzle. Even though Bunnicula is absent from this adventure, there is still a large cast of characters to entertain the reader. Chester is still every bit as snarky and pompous, assuming facts before he has all of the evidence and jumping from conclusion to conclusion without really thinking about logic. Harold isn’t quite as clever or conniving as Chester, but he has a big heart and is willing to give people the benefit of the doubt. The other dogs and cats at the Chateau Bow-Wow – Max, Georgette, Louise, Howard, Heather, Taxi, and Lyle – are somewhat flat, but despite their two-dimensionality, they move the plot along and provide excellent foils for Harold and Chester. Howe has borrowed from the great mystery tradition of Agatha Christie and given the reader a sort of children’s version of “And Then There Were None” that keeps the pages turning until the very end and it has a much happier ending than its inspiration. It is a clever and witty tale that will entertain readers of all ages reading after reading after reading.